Kunoichi s a modern term for a female ninja or practitioner of ninjutsu (ninpo). The term is thought to derive from the names of characters that resemble the three strokes in the kanji character for woman (女 onna); said in the order they are written: ku (く) – no (ノ) – ichi (一). Early literary quotes include Enshū Senkuzuke Narabini Hyakuin (遠舟千句附并百韵?) (1680) as well as Maekuzukeshū (前句付集?) (1716), which specifically associates the word with the kanji 女 supporting the etymology. The “くノ一” writing requires the use of one character from each Japanese character set – first hiragana, then katakana, then kanji. While hiragana and kanji can exist in the same word, katakana generally cannot appear in conjunction with the others. There are exceptions to this, for example in “ゴミ箱” and “消しゴム”. Female ninja are mentioned in Bansenshukai, a 17th-century Japanese book compiling the knowledge of the clans in the Iga and Kōga regions devoted to the training of ninja. According to this document, the primary function of female ninja was espionage, finding legitimate service positions in the households of enemies, to accumulate knowledge by gaining trust or overhearing conversations. One historically accepted example of this is Mochizuki Chiyome, the 16th century noblewoman with ninja roots who was tasked by the warlord Takeda Shingen with recruiting women to create a secret network of a few hundred female spies. Sometimes if you just put on one item, you immediately get an idea what you want to do with it… I am sure all of you had that happen at least once. Something like this happened to me when I put on the “Isis” collar and skirt from [sys]. When I put it on, I immediately had the vision of a ninja/asian inspired look. I remembered the awesome “Mei” hair from EMO-tions – that was sold on the south-asia inspired round of On9 – which I decorated with the cool “Albedo Horns” from Ayashi. [LAB737] makes the most amazing armor parts I ever saw. So detailed and as well used looking makes them very realistic and I could not resist to add parts of the “Dragoon” armor to my left arm. I found a very little store, with just a few items for sale on MP and instantly fell in love with the “Katana Pose Collection”. 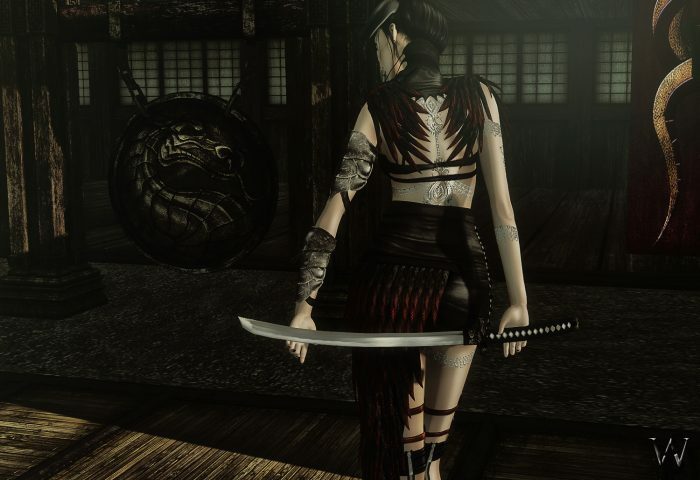 A whole set with many variations of 10 different poses and 2 amazing handcrafted Katanas. Even more I was surprised that they were made for a female warrior, so exactly what I wanted. The poses do look more show or performance like than, fighting itself and so they were the perfect animations for the pictures. First I tried to build me a photo set, but soon I realized – I do not have the right items nor the knowledge of buildings and sceneries, that would suit the ideas and satisfy the styling. 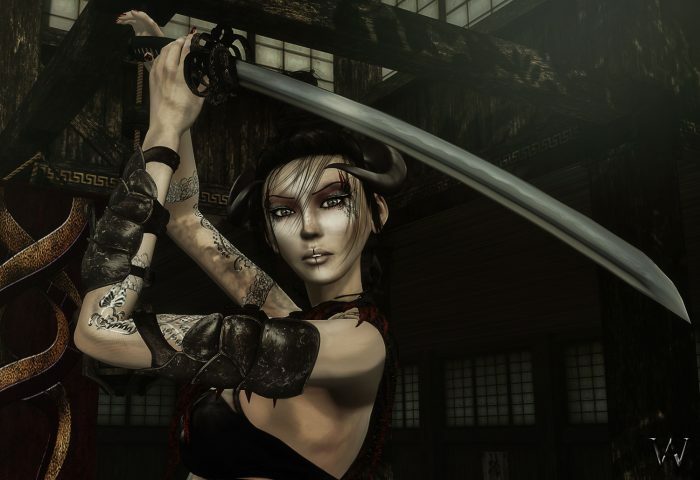 I jumped into the SL search and looked for places with key words like: japanese, warrior, ninja, katana and many more until I found “Kowloon”, a little island, which was empty when I arrived but the buildings and the garden was incredible beautiful. While I was shooting, the sim filled up more and more, but I did not see anyone around me and I became curious. I started to cam around, to spy silently, when I found an arena with a hell of a lot people who had begun a fight. I was so excited to see that, to see them fighting with Katanas and all kind of asian weapons, that I stopped shooting for a bit and just watched without disturbing them. I had so much fun watching them, that I nearly forgot to finish my shooting. It was an amazing afternoon and as well a lot of fun and I enjoyed the trip to a past time, that is totally new to me.